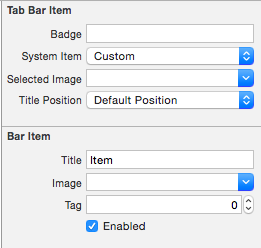 The easiest way to make a tab bar controller is through Xcode’s template. In Xcode, press Command-Shift-N or File>New>Project. Select the tabbed application. This will give you a window with two tabs installed with two labels each and a tab item on the bottom of each controller. The template tends to make things more complicated instead of less, so it is rarely used. 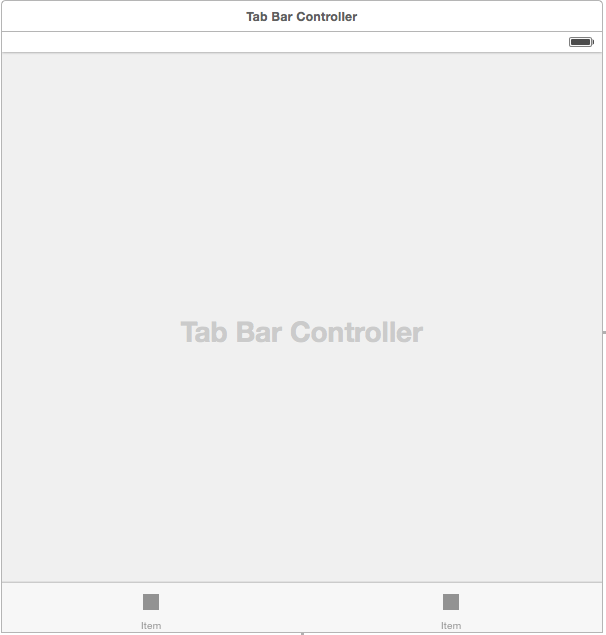 The most common way to make a tab bar controller is to start from a single view and embed it in a controller. We’ll try an example of this one in Xcode. Press Command-Shift-N and select Single View. 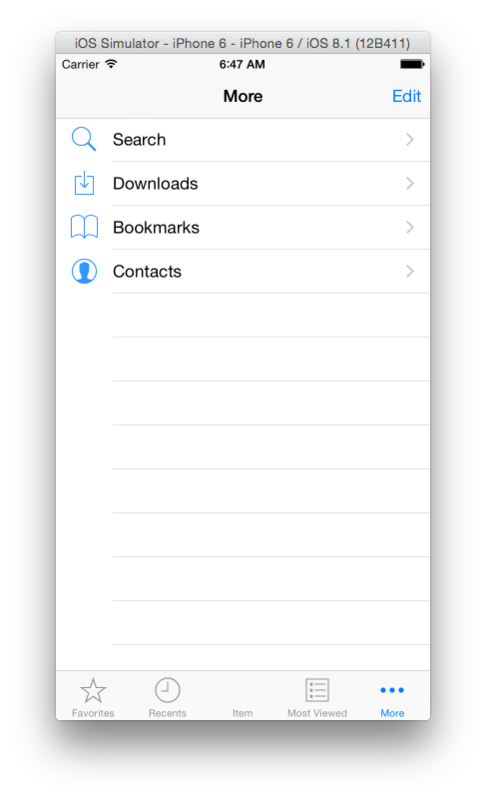 Make a file named SwiftTabBarEmbed, using Swift as the language and with a Universal device. Once created, go over to the Storyboard. Select the view controller by clicking the view controller icon or title, and select Editor>Embed in>Tab Bar Controller. This will turn the single view controller into the first view controller of the tab bar. Add another view controller by dragging out a view controller then control-dragging from the tab bar controller to the new controller. 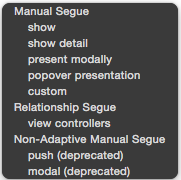 In the popup, select under Relationship Segue the view controllers option. A segue appears on the story board. You’ll see a second tab in the tab bar controller. To configure the tab bar icon, go to the Item icon in the View Controller (not on the tab view controller) we just made and click it. This will bring up in the properties inspector the Tab Bar Item and Bar Item properties. In the Tab Bar Item properties is the System Item drop down. This is where we configure the tab bar button. In the System Item menu, Click the drop-down for System Item. you will see a list of system icons. Select Favorites. The Icon changes both on the view controller and the tab bar controller. Click the other view controller’s tab bar, and change the system Icon to Recents. We get an extra tab we did not set up titled More. Tap on the More icon. Compact widths cannot handle more than five tabs. If you add more than five tabs, it places a More tab as the fifth tab and makes this table view for you. If you tap the tab in the table’s cell, the tab’s controller will appear. One of the system icons you can use is a More icon. Be careful when using the More icon in a tab bar. 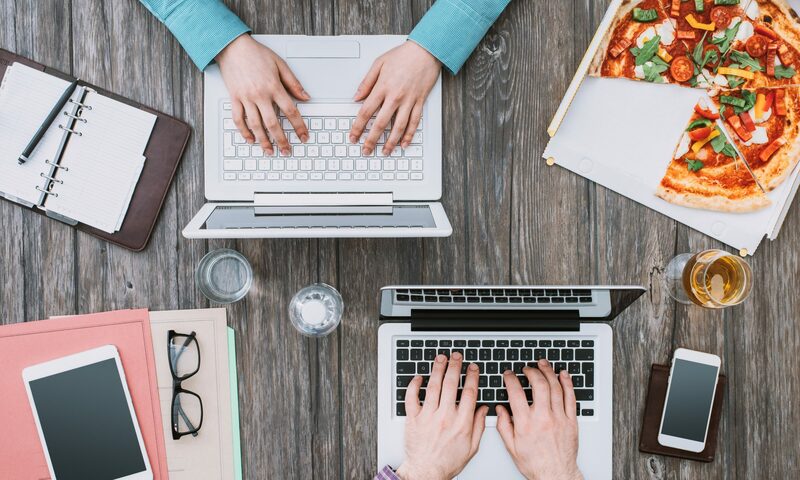 It can cause user confusion between the More tab and your own use for More. Since we now have five icons, this will keep off the More icon. Click on the tab bar for the one custom controller.We can see all the tab bar properties. The lower half has bar item properties, which directly control the title and icon for the tab. We can easily change the text. Change the Bar Item Title to Square. If we change a System items’s title, it becomes a custom item, and the icon disappears. Click on the Contacts Icon. Change the title to Pizza. Do the same to change Downloads to Pie. All become squares. For those not familiar with Apple image naming conventions, low resolution images have a file name. 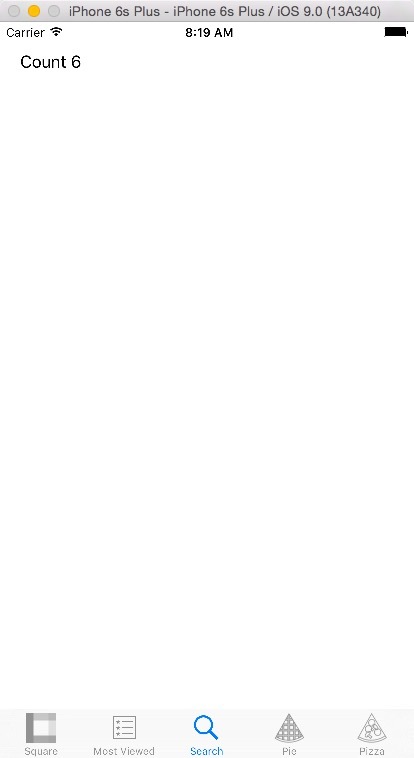 Retina Images have @2x appended to that file name. This tells Xcode to know what resolution it is. We have both 60×60 pixel retina and 30×30 pixel standard images. By loading both into Xcode, the system will use the correct one automatically for the device. 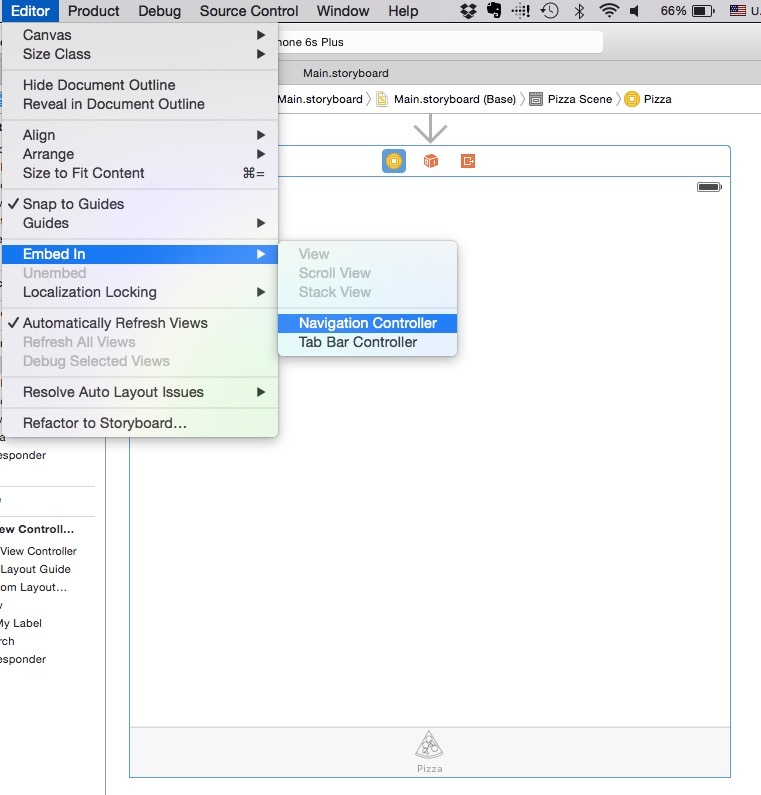 In Xcode’s navigator panel, open up images.xassets. Select both gradient bar icon files. Drag them into the center panel in Xcode, which will highlight, and the number 2 will appear next to your cursor. Release the mouse button, and you will see a new collection in the image assets. 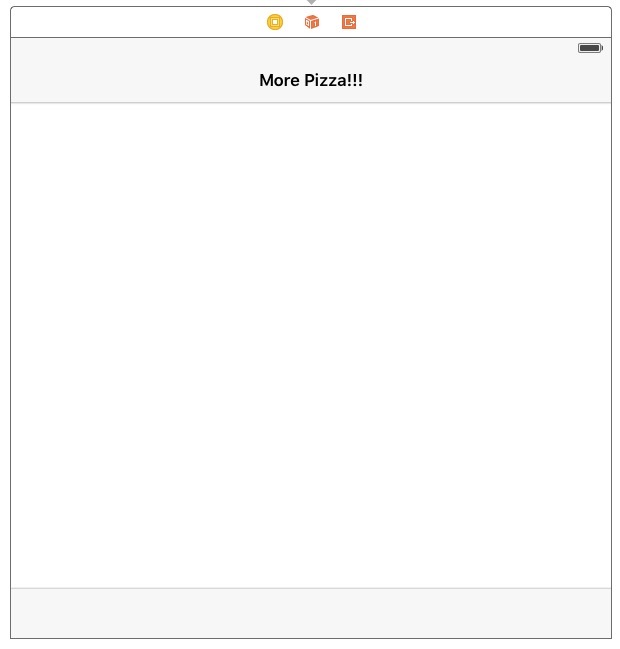 Do the same for the pie bar and pizza bar files Select the pizza bar.png and pizza bar@2x.png files and drag them to the assets manager. 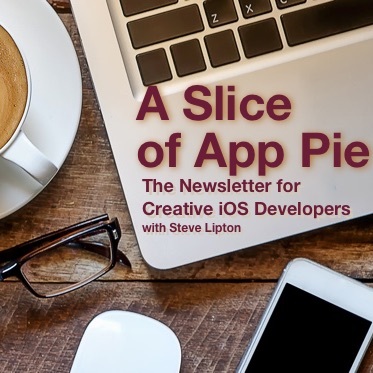 Do the same for the pie bar.png and pie bar@2x.png buttons. Return to the storyboard. On the tab we titled Square,click anywhere on the tab bar. 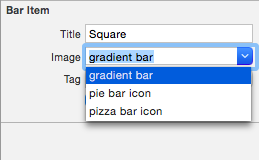 Select the image drop-down in the tab bar properties and select the gradient bar icon. 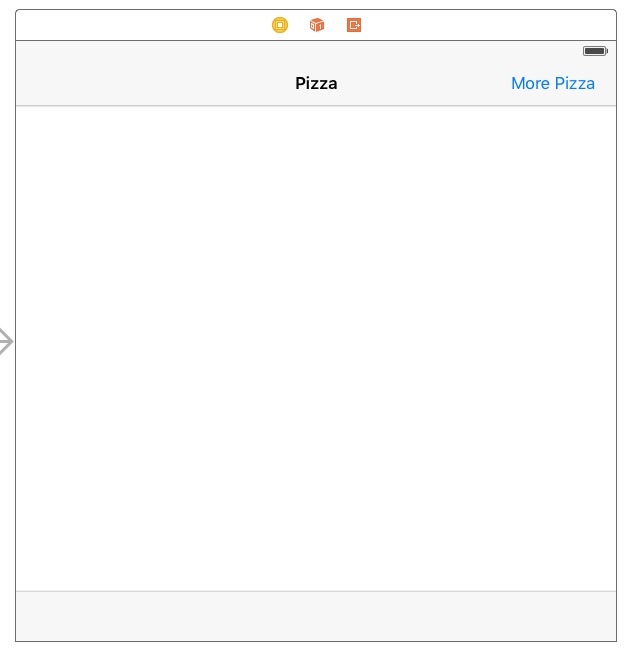 Find the Pizza and Pie tab views on the storyboard, and change them the same way. 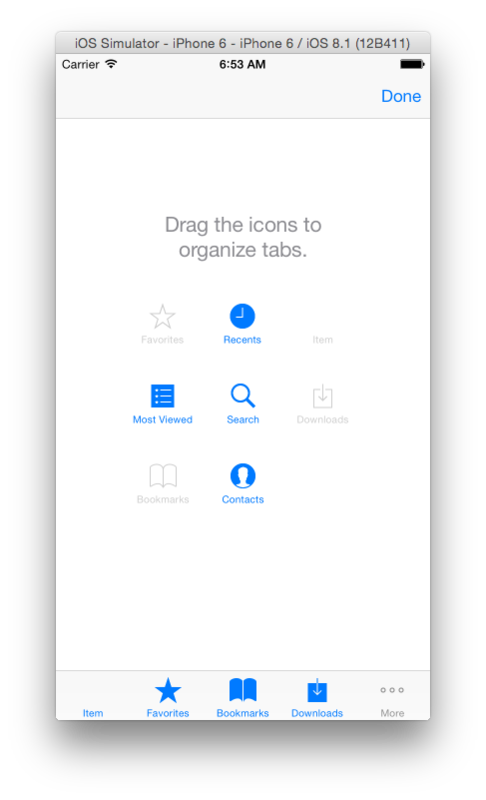 The Tab bar controller now has three custom icons. Build and run with the iPhone 6 simulator, and you will see our three icons, with one highlighted as selected. Tab Bar controllers make a set of single view controllers running parallel to each other. The tab bar switches the view, but the view we leave does not get dismissed, just hidden. there are two uses for such a controller. The first is a series of small applications related to each other. Apple’s clock app is an exmaple. The timer, alarma clock, world clock, and stopwatch all are related by a theme of time. All run independently of each other. The second use of Tab bar controllers is to use a shrared data set in different ways. Social media apps like Twitter or Instagram for example use tab bars to have different functions of displaying posts, searches, or displaying notifications that all use the same database. For this second type of use, see see Passing Data in Tab Bar controllers. We’ll look at the first type here. You already know how to hook up a view controller for a tab bar. 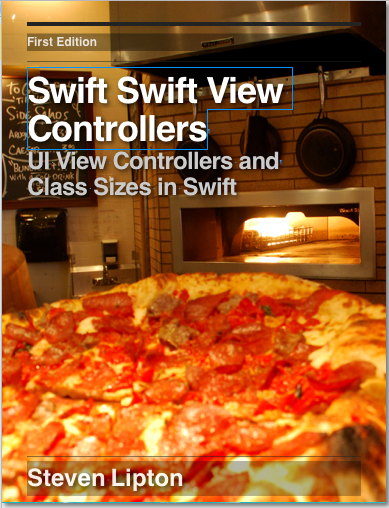 First make a new view controller class by pressing Command-N. Make a new Cocoa Touch Class view controller named SearchViewController. Change the class code to this. I did not use viewDidLoad here. In tab bar controllers, ViewDidLoad only fires once, when we first load the view controller. The method viewWillAppear fires every time the view appears, and so we use that to do any updating. This code assumes that this view controller will remain active even when it is not visible. 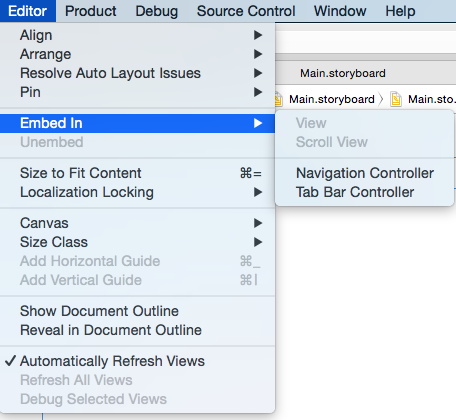 Go to the storyboard and select the Search view controller on your storyboard. In the identity inspector set the class to SearchViewController. 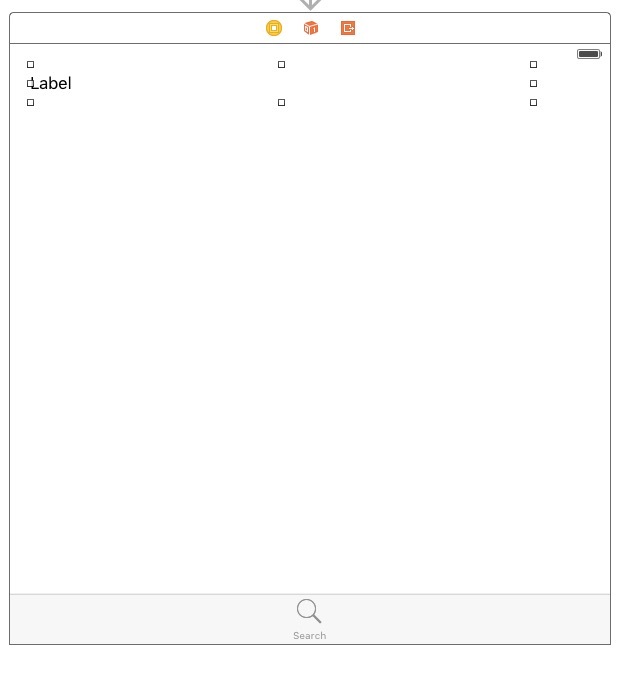 On the view in the storyboard drag a label to the upper let and size it up a bit. Open up the assistant editor. Drag from the circle next to the outlet to the label to connect it. Build and run. Select the search tab, then another tab a few times. You will see the count increas every time you return to the search tab. The view controller changes into a Navigation controller with the tab bar icon. Attached to the navigation controller is a view controller. Double click the center of the navigation controller bar. Change the title to Pizza!!. Drag a bar button item to the upper left of the controller on the storyboard. Title it More Pizza. Add another view controller, below the one we just configured. Control-Drag from the bar button item to the new view controller. Set up a show segue. In the new view controller, Drag a Navigation item to the navigation bar. Change the item’s title to More Pizza!!! Build and run. 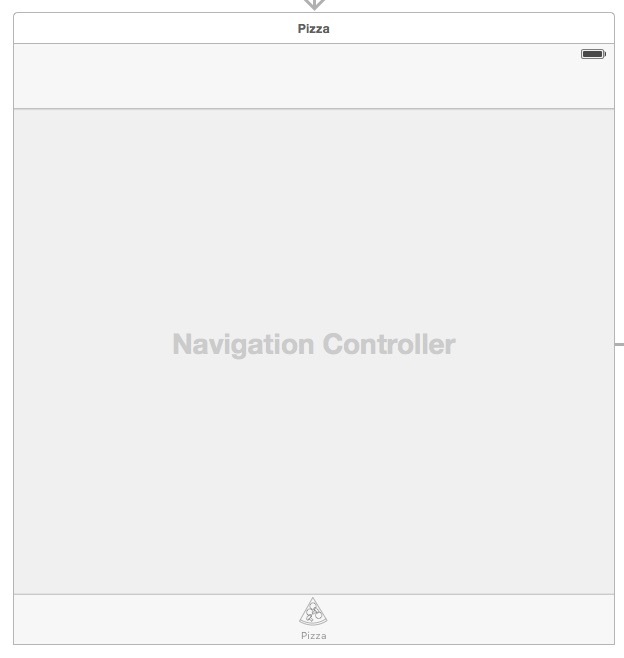 Select the Pizza tab and we have our navigation controller. Tap the More Pizza Button. The More Pizza!!! View Appears. Now go to another tab and then back to the Pizza tab. We remain on the More Pizza!!! view. You can use navigation controllers inside a tab bar controller to our heart’s content. However, tab bar controllers can only be used once in a project, as the top level controller. So embedding more tab bar controllers does not work. This is most of waht you need to know to work with basic tab bar controllers. For more information on sharing between the controllers and a more extensive coding example, see Passing Data in Tab Bar controllers. How could you make the tab bar item resemble the actual image being used rather than apple adding a tint to the selected and non selected states? there is a property of images that you need to set to the correct mode. For Bar items it is in template mode, which uses the tint. Changing the mode to .AlwaysOriginal will solve this problem. If you are placing the images in by the storyboard, you’ll have to set this in code somewhere like viewDidLoad, setting up an outlet to the bar image. It’s something like this on the Xcode tabbed application template. @IBOutlet weak var barItem: UITabBarItem! You’ll have to force the view to load to make this work 100% correctly but this is the basics. IN a tab bar icon, no you can’t use those icons. A tab bar icon indicates something that is a parallel view to other views. Those are more actions that views, so it doesn’t make sense to use them here. 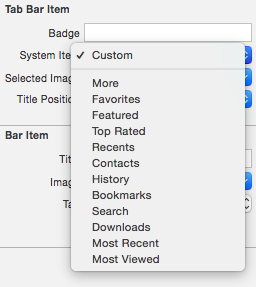 The good news is they do exist as system icons in a tool bar button item, which are actions. Look up UIBarButtonSystemItem, or you can see the list in Interface Builder in the properties attributes for a bar button item.